Mess With Texas (MWTX) has recently revealed their full lineup for March 19, showcasing over 20 awesome performances. Check the lineup and more details after the jump. 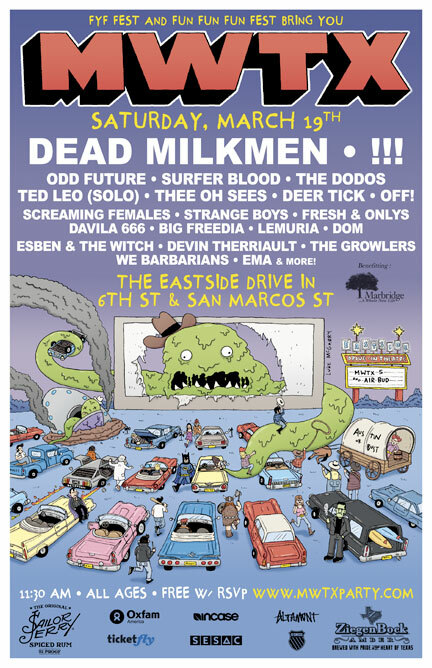 Presented by FYF Fest and Fun Fun Fun Fest, the MWTX party takes place March 19 at the East Side Drive In on the corner of 6th street and San Marcos in Austin, TX with doors opening at 11:30 AM. The event is free and for all ages. To RSVP, click here. Stay posted to hear about more performances being added to the lineup as well as set times and other fine details.